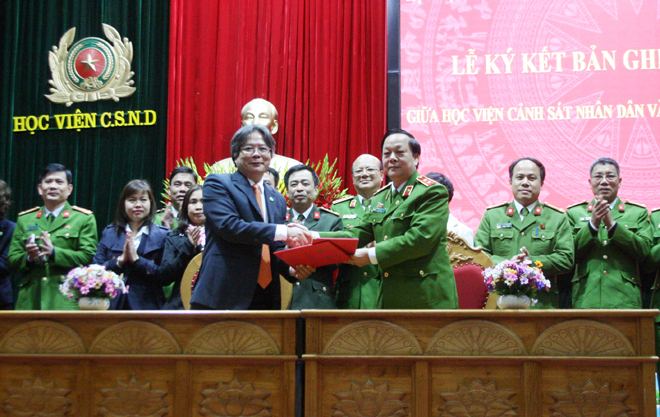 PSNews – The People’s Police Academy on January 9 signs a memorandum of understanding (MOU) with Vietnam- Germany Hospital on cooperation between the two units in strengthening scientific research and staff training. According to the MOU, the two units will cooperate in the areas of their strengths, for instance supporting each other in conducting scientific research projects relating to police and health affairs and exchanging information, training materials and documents. In addition, the two sides agreed to support each other in human resources development, security and order, healthcare, environmental protection, and voluntary blood donation. The People’s Police Academy and Vietnam-Germany Hospital also agreed to increase cultural exchanges and to organize study tours for their students and staff to learn advanced models from the other institution. The cooperation deal is expected to strengthen the understanding and solidarity between the Ministry of Public Security and the Ministry of Health in general. Shortly after the signing ceremony, a large number of students from the People's Police Academy participated in a voluntary blood donation program at Vietnam-Germany Hospital, in an effort to ease the scarcity of blood in treating patients at the hospital.